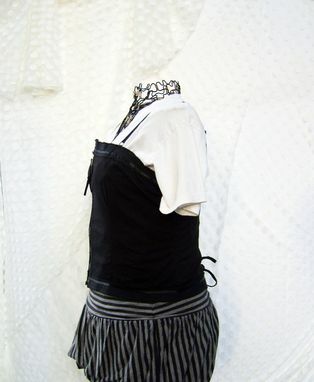 This bustier was crafted entirely of upcycled materials. The main body came from a button-up shirt. The cotton-lycra blend fabric allows the bustier to fit closely without overly constricting. 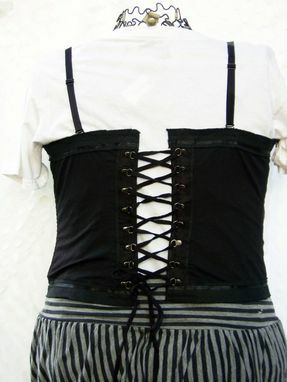 It is lightly boned in the front, back, and sides with polyester boning. The boning came from a thrift store, unused, in its package. The front zips closed and the back laces together with brass-colored lacing rings. The lacing rings and pseudo-suede (micro-fiber suede) panel that they are riveted to came from a boot. I cut them off of the boot and hand-stitched them to form the back panel. The laces are also from the boot and are pseudo-suede. The straps came from a convertible bra and are adjustable. The straps have hooks in the back, so they can be straight, crossed, or made into a halter. It is trimmed with canvas and satin picot ribbon. The overall effect is riveting! 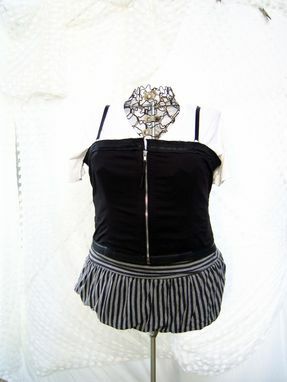 The bustier is shown with the black sparkly capelet, also upcycled. 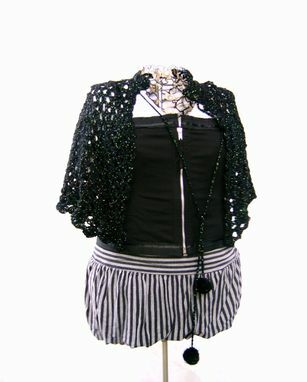 It would also look lovely with the black crocus necklace.